I'm gonna take a stab in the dark and say you're echoing the feelings of quite a lot of people there. Hope the next monthly early unlock is good, feels like a while since there was an HB bundle I actually got excited about. Do any of these Titles work on Mac or Just PC? The various DLC included in the middle tier is for Dirt 4 and F1 2017.....very presumptuous of them to think your actually going to use the money off vouchers...especially after you misread it on your mobile and thought they were included in the middle tier and rushed through checkout before the price went up a few pence. It's an alright bundle. I been after a while trying to get the F1 series so this would be a great way. Also the new micro machines, dirt rally & toybox is perfect. slightly confused about why only dlc included for games you don't have unless the extra stuff next week is the game. Probably not but for £11 ISH all in that is a bargain. I'm gonna take a stab in the dark and say you're echoing the feelings of …I'm gonna take a stab in the dark and say you're echoing the feelings of quite a lot of people there. Hope the next monthly early unlock is good, feels like a while since there was an HB bundle I actually got excited about. I feel the same. Really not into racing games unless they involve weapons (Wipeout, Mario Kart, etc.) and I don't see the point in having F1 2011, 2012, 2014 and 2015 in the bundle when there's 2016. I mean that's basically the same game 5 times, then Dirt 4 and Dirt Rally are basically the same game twice. I'm tempted to buy it for Micro Machines because I had the original back in the day but I've seen some terrible reviews for this new one. If you click on the box art pictures, it shows more details and compatibility Grid 2, Micro Machines and Dirt Rally seems to be the only ones Mac compatible. I feel the same. Really not into racing games unless they involve weapons …I feel the same. Really not into racing games unless they involve weapons (Wipeout, Mario Kart, etc.) and I don't see the point in having F1 2011, 2012, 2014 and 2015 in the bundle when there's 2016. I mean that's basically the same game 5 times, then Dirt 4 and Dirt Rally are basically the same game twice. I'm tempted to buy it for Micro Machines because I had the original back in the day but I've seen some terrible reviews for this new one. It's god awful. 3/4 of the game requires online play. Basic stuff on single player. Ok i bought Dirt rally for VR at £8 on sale last month but got a refund due to how tough it was, BUT, for a extra £3.21 and 6 games i don't have i am willing to grab it again. Give your new F1™ career a real head start with the F1 2016 ‘CAREER BOOSTER’ DLC PACK, which includes a Career Research and Development Boost"
Monetization trumps game balance yet again. Due to regulation changes and such the F1 games can change quite a bit year to year. So it's not too bad that they're all included. Which one of those F1 games is the best? Last time I played an F1 game or was on the playstation and it was ace. Awesome bundle for me - if I didn’t finally buy Dirt Rally last week !!!! 2016 plus DR would have been great for me. Have 2012 and then the series went downhill until 2016 which is supposed to be back to top quality again. Grid2 is great but I’ve got it. No longer has a Steam store page, due to licences expiring. 2nd tier looks decent - hopefully the coupons come in use if there's a sale on Dirt 4. So if it's not GRID, F12013 & Dirt 3 what could both teir additions be? If it is DLC content i'll be slighty happy but if they are vouchers then not much of a waiting list. Also note this bundle will be up for 3 weeks not the usual 2. I suspect a new game bundle next week to replace a book bundle. Other DLC/coupons for F1 2017 and DiRT 4. It appears that F1 2012 and Toybox Turbos in tier 1, Grid 2 in tier 2 and Dirt Rally and F1 2016 in Tier 3 are the highlights ...I think it's F1 2012 for me. With previous years as a guide, the next bundle is likely to be the Yogscast Christmas bundle on Dec 1st with a multitude of games (it was £24 last year for 30+ games, $25 in 2015, £3.16+ in 2014, £15.29 in 2013). When a new humble bundle come along I usually buy it for myself and a gift link for my friend. 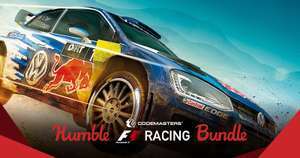 We can only sell a limited quantity of the Humble Codemasters Racing Bundle 2017 . We have canceled your order and will not charge you. Please try again later. It's god awful. 3/4 of the game requires online play. Basic stuff on …It's god awful. 3/4 of the game requires online play. Basic stuff on single player. You'd wonder how they messed up such a simple formula. If they released MM '96 with new tracks and online multiplayer I'd be all over it. Disappointed after being quite interested when I got the email. It's mostly just DLC, discounts and multiple versions of the same game. F1 2013 was removed from steam a while ago, I think due to the classic content (licenses expiring). Depends, 2011/12 were the V8 gen' cars and '14/15 the current V6 hybrids, but yeah the former games of those two (11 & 14) weren't very good. When a new humble bundle come along I usually buy it for myself and a gift …When a new humble bundle come along I usually buy it for myself and a gift link for my friend.This time I tried to do this, and on my second purchase I got this message:We can only sell a limited quantity of the Humble Codemasters Racing Bundle 2017 . We have canceled your order and will not charge you. Please try again later. Surely you could just make a new account to get around it? Micro Machines gets poor reviews and Toybox Turbos looks almost identical to the Android version of Micro Machines (actually trying to work out whether it is actually identical). ...the next bundle is likely to be the Yogscast Christmas bundle on Dec …...the next bundle is likely to be the Yogscast Christmas bundle on Dec 1st with a multitude of games (it was £24 last year for 30+ games, $25 in 2015, £3.16+ in 2014, £15.29 in 2013). Confirmed - Jingle Jam 2017 from Friday (in 1.5 hours?). $35 starts 5PM, why you no read? Thanks, I was distracted by the prospect of numerous games. And I only read the announcement (not the threads). well only 1 title added on the mid tier, Grid Autosport, and it looks as far as I can see that the only thing added in top tier was DLC for Grid Autosport.